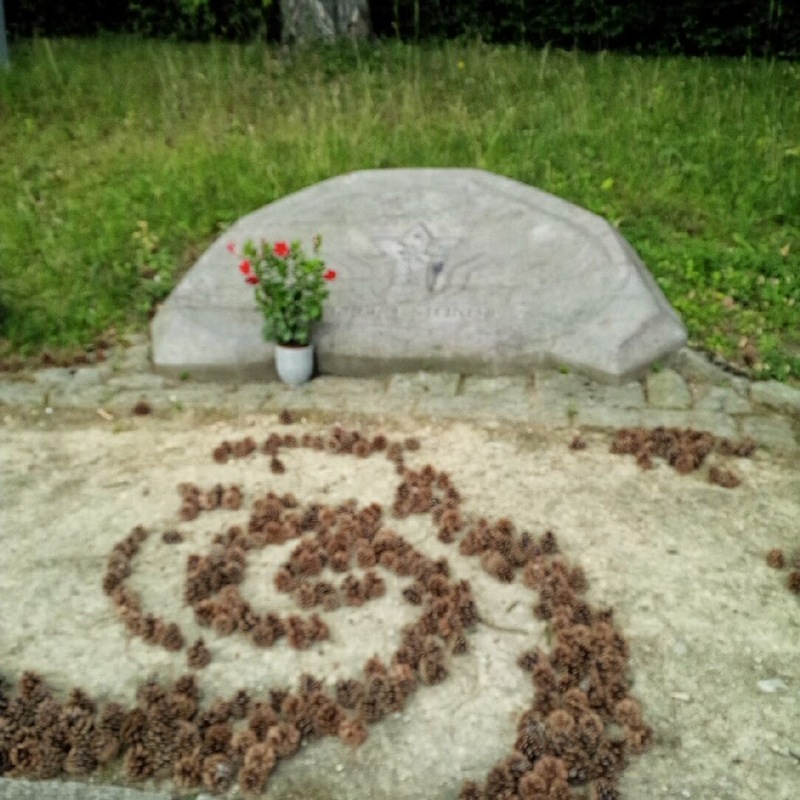 With apologies for the picture quality, I am no photographer as I was periodically reminded this weekend, but this is the grave of Rudolf Steiner at Dornach in Switzerland, where a new Goetheanum has risen to replace the old, destroyed by fire. It is in a beautiful location, saturated in a quieting silence, and it is surrounded by a number of original buildings also designed by Steiner that mirror and are mirrored in the surrounding architecture. Steiner never ceases to intrigue me - that extraordinary admixture of improbable visionary, acute spiritual psychologist and progenitor of a number of radical movements in agriculture, the care of the learning disabled, education, finance and therapy. If by the fruits you will know them, Steiner is on the side of the angels. It was a delight to see, and taste, however briefly, one of these fruits; and, to see his bodily resting place, in a contained, quiet garden, obviously lovingly tended and cared for. His deepest critique is preserved for any form of dualistic thinking that constructs a world of black and white. Here is a world of the blessed - the right, the in group - and here are the damned - the other, the out group. We can only envisage the world aright if we think in colour. As a child, Douchan Gersi, found himself transported from his native Czechoslovakia to the Congo (his parents had left for political reasons) and subject to experiences of the uncanny. These ranged across a servant visiting from the dead to thank Douchan's mother for arranging his funeral to witnessing reverse magic where the perpetrator of an evil spell has it returned to him with deadly effect. With this as background, Gersi became an explorer, writer and film-maker both of the outer world of 'peoples of tradition' (as he chooses to call primordial or indigenous people) and their inner belief structures - and where the two meet in exercising changes in the world that our current 'scientific paradigms' exclude as possible. I remember my first visit to Moldova not least because it was the day after the July 2005 bombings in London. I had walked half way across the city to Paddington and taken the first train to leave for Oxford and found myself sitting opposite two people who had been directly affected by one or other of the blasts. One had taken refuge in vodka, the other in repeating his story over and over. I simply sat listening and wondering whether anything would be working the next day. It was and I found myself in Chisinau. One of my most vivid memories of that visit was going to the National Art Museum on a Sunday afternoon and finding myself the only person there except for the staff, one of whom followed me round assiduously turning lights on and off as I passed. I can remember nothing of the art except the necessary Roerich was there. So prolific was he that I expect every significant, and possibly less significant, public gallery in the former Soviet Union had one! Buhner's 'Plant Intelligence and the Imaginal‎ Realm' asks that we see the world in a radically new (old) way. With our sensory gates widened, we will find ourselves immersed in the scenario that is the world, unfolding as a bit player in self-organising, intelligent systems, no more and no less important than any other organism, with work to do that is ours but never at the 'apex' of evolutionary development. Unlike the world of reductionist mater‎ialism, this is an intelligent, purposeful world intent on fulfilling expression and full of continuous innovation. Unlike the world of the religious fundamentalist, it is not a world made for man to which everything else is merely supporting background (to be stewarded or exploited according to taste). My mother had me listen to a tape of Fr Laurence Freeman introducing meditation where he quotes Simone Weil saying that, "Daydreaming is the root of all evil". He is discussing the importance in meditation of remaining present to the unfolding saying of the mantra, of staying in the present. However, the use of the phrase 'day dreaming' sparked a conversation in her meditation group, after all, some people get good and inspiring thoughts out of their day dreaming. If you watch a child 'day dreaming' are they not doing it with extraordinary engagement, attention and awareness (even as they are ignoring the lesson going on around them). Carried over into adulthood is this not what Einstein was doing when he was imagining travelling on a beam of light, a 'day dream' out of which the theory of relativity was born?